NIRVANA IS HERE is the story I’ve been writing or trying to write my entire life. Like the protagonist of the book, I grew up in the segregated suburbs of Detroit, though in the 1980s, not the 1990s, and like the protagonist, I felt very much like an outsider. I remember vividly being a freshman in college in the fall of 1991, sitting on the floor of a friend’s dorm room, when another student came running in, saying, “You have to hear this song” and putting on “Smells Like Teen Spirit” by Nirvana. The song felt so different from anything I’d heard before, and it felt in a way like a kind of permission to be who I was, to claim an identity I’d been running away from for so long in my life. When I was twelve, I was sexually assaulted by another boy my age, a neighborhood bully who threatened to kill me if I told anyone what he’d done. His threat notwithstanding, I did tell my therapist, who was legally obligated to tell the police. I remember vividly sitting in the police station and being asked if I “wanted it,” which was my assailant’s defense for what he’d done. Because I said no, both to that boy and the police, I was safe. This led me to the wrongheaded conclusion that if I admitted to anyone that I was attracted to other guys, he would be found innocent and I would be found guilty, and my assailant would be set free and could come find me and exact his revenge. All this is the background material that inspired the fictionalized version of the story of this book. It’s material that for many years, even as an adult, I felt that I had to keep hidden, that somehow others would feel repelled if they knew the truth. In my earlier fiction, I’ve written semi-autobiographical stories, but always with this key fact of my own life erased or shunted off to the side. This book is the first time I’ve attempted to grapple with this subject matter head-on, and it’s been liberating. Suddenly, I feel as though my fiction has taken on a new sense of vitality and honesty that’s liberated me to tell all kinds of stories, not just my own. I recently wrote an autobiographical essay about this time in my life, which appeared in Tin House magazine, called “Sweetness Mattered.” In the piece, I describe my sexual assault and then how at a new school, I met another boy I liked, to whom I was afraid to confess my true feelings, feeling that at the time, I didn’t fully understand. I found out that he liked a certain kind of candy, and I began bringing him a piece of that candy every day to school—for three years. The gesture felt therapeutic. Even though nothing romantic ever resulted, our budding friendship had a curative effect on me, made me feel as if I weren’t the image of myself that the boy who’d assaulted me wanted me to believe. When the essay came out, I was shocked by the overwhelming response to it. I had no idea that this part of myself that I’d kept hidden was exactly what people were interested in knowing about me. In high school, I also discovered that I had an interest and talent in tennis and in painting and drawing. Becoming proficient at both of these also helped me find myself and move toward healing. Perhaps the strangest part of this whole experience has been that though many of these events are very much in the past in terms of time, in terms of psychic effect they have stayed with me and to a certain extent shaped me. For that reason, I’ve written this story as a braided narrative, with the past story framed by the present, just as fragments of my past have stayed on my mind in my own present life. As I said earlier, I feel as though I’ve been writing this book in some form or another my entire life, but it wasn’t until the past few years that it occurred to me to shape this material into a single, coherent story, in the form of a novel. Recent political and cultural events regarding the #metoo movement post-dated much of the generative writing process, but as I was completing this book, knowing that other people in my situation were telling their stories gave me courage and inspired me to bring my book across the finish line. In fact, I read several survivor’s stories and psychology books dealing with these issues, and I was shocked by the sense of recognition I experienced as I read all these accounts. 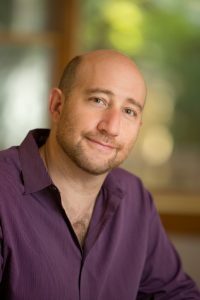 AARON HAMBURGER is the author of a story collection titled The View from Stalin’s Head (Random House), winner of the Rome Prize by the American Academy of Arts and Letters and nominee for a Violet Quill Award. His second book, the novel Faith for Beginners (Random House), was nominated for a Lambda Literary Award. His writing has appeared in The New York Times, The Washington Post, The Chicago Tribune, O, the Oprah Magazine, Details, The Village Voice, Poets & Writers, Tin House, Out, Michigan Quarterly Review, The Forward, and numerous other publications. In addition, he has also won fellowships from Yaddo, Djerassi, the Civitella Ranieri Foundation, and the Edward F. Albee Foundation as well as first prize in the Dornstein Contest for Young Jewish Writers. He has taught creative writing at Columbia University, the George Washington University, New York University, Brooklyn College, and the Stonecoast MFA Program. He currently resides in Washington, D.C.